With seven home runs after six games, a Rockies rookie leads all of Major League Baseball in round-trippers. That same rookie hit home runs in each of his first four MLB games, a first. Additionally, he hit seven home runs in the first six games to start the season, more than than any major leaguer in any season-starting, six-game span; he surpassed Willie Mays, Mike Schmidt and Larry Walker, who all had six. Lastly, said rookie was named the National League Player of the Week. Oddly, another rookie was named Player of the Week in the American League. Two rookies in the same opening week? That’s also a first. 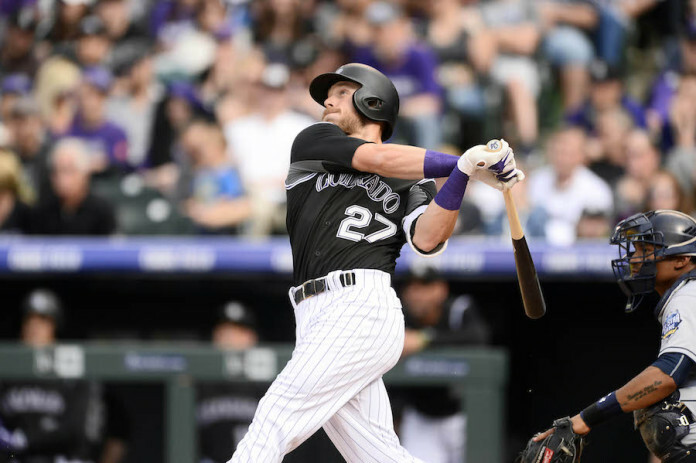 Of course, I’m talking about the Rockies’ rookie sensation, Trevor Story – every punster’s newest favorite player, as he’s clearly The Story of baseball season thus far. What are the odds? 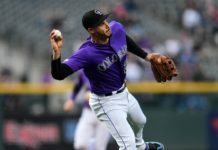 The Rockies have been around since 1993 and no Rockies rookie has ever done any such thing. So, right off the bat, generously, it’s 1-in-24. Then again, no rookie with any team has done it. With a documented history of 146 seasons (SABR begins all things baseball in 1871) seasons, let’s say 1-in-146. If we factor in an average number of teams each season of, let’s say, 20 per season, that’s 1-in-2,920. Doing what Mays, Schmidt and Walker did? Well, that’s only three players in roughly 16,000, so, that’s 1-in-5,333. How bad were the San Diego Padres to start the season? They didn’t score a run in their first 30 innings of 2016. In their first 27 innings of futility, the Padres became the first team in MLB history to be shut out in its first three games in its opening series at home. They surpassed the MLB mark of 26 straight scoreless innings to open a season set by the 1943 St. Louis Browns. 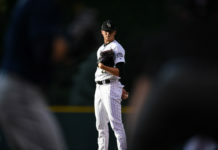 But then – and get this – they exploded, scoring 13 runs to spoil the Rox home opener, and then 16 more on Saturday night. It was the first time the Padres scored 15 runs in a game since August of 2011. In just two games at Coors Field, they’d scored four more runs than they’d given up through their first three (25). What are the odds of all of that (whatever “all of that” is)? That kind of ineptitude hasn’t happened to a Major League team for 74 years, and the Padres themselves haven’t scored that many runs in a game for at least five. Shall we go with 1-in-80 just to be conservative? Let’s switch it over to basketball. What about the odds that the Golden State Warriors, a longtime laughingstock in the NBA, would match the all-time single-season wins record? The 1995-96 Chicago Bulls pasted 72 in the record book. As of Nov. 24, 2015, when the Warriors jumped out to a 15-0 start, the Westgate Las Vegas SuperBook offered the prop bet “Will Golden State win 73 or more games in the 2015-16 regular season?” At that time, the odds of a record-breaking season were plus-500. The odds the Warriors wouldn’t get it done were minus-700. Wednesday night, a Golden State win pays $500 on a buck. Not too shabby. And what about that epic meltdown from Jordan Spieth on Sunday at the Masters? As tragic as it was, let’s call it a wash. The odds of that happening? Well, there’s no way of really telling, but how many quadruples could Spieth possibly make in one season’s worth of golf? One? Two? And he plays a lot of golf – a lot. Even a hacker like me only cards a quadruple every so often (let’s say one per 36 holes). But here’s the equalizer: What are the odds that a 22-year old wins back-to-back Masters titles, never once giving up the lead on any day of the tournament? It’s never happened – still hasn’t – so it’s impossible to calculate. It’s right up there with me hitting a hole-in-one; I’m still waiting. Either way, we were guaranteed to see something never before seen by sports fans. Here’s a prop bet you never could have made: Von Miller stays alive on “Dancing with the Stars” through Week Five. Odds of the Broncos winning the Super Bowl prior to the season? 14-to-1. Odds of Miller being asked to dance on national television? Well, that’s just odd in general. Odds of Miller dancing his way through a month’s worth of episodes? Safely, let’s say that these odds – if you’d have asked the Westgate back in September – would have been somewhere in the neighborhood of 308-to-1. What about the odds of all of that happening? Throw in the fact that the March Madness – just a week ago – concluded with a buzzer-beating shot for the win (one of just three in championship “gamers” in tourney history – Lorenzo Charles in ’83; Mario Chalmers in ’08) and it’s been a month already jam-packed with the improbable. What are the odds that all of that actually happened within a 10-day span? It’s nearly impossible to say, but I know one thing: I shoulda bet the parlay.